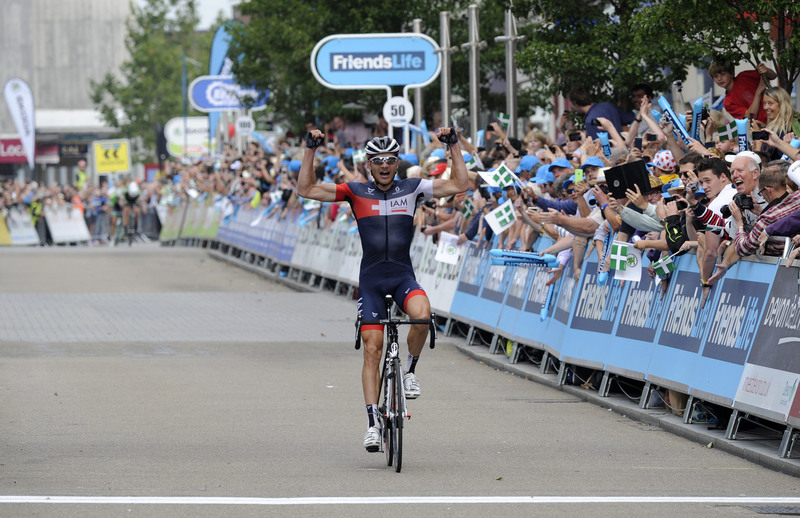 Matthias Brändle of IAM Cycling took the first breakaway win of the race after leaving his companions behind on Stoke Hill, the final climb of the day. The day was characterised by a lack of enthusiasm for the chase from the peloton, with only Garmin-Sharp putting in a sustained attempt to chase the four escapees. Brändle was joined by Andreas Stauff (MTN-Qhubeka), Maarten Wynants (Belkin) and Shane Archbold (An Post). The group were never given more than three minutes by the peloton, as Brändle himself was only three minutes down on GC at the start of the day. The majority of the stage was relatively uneventful, with OPQS controlling the peloton. Garmin took to the front in the final 50km and it was clear they wanted to provide a launchpad for Jack Bauer to attack on the final climb of the day. Tinkoff-Saxo and Bardiani-CSF came to the front in the last 15km, but the gap to the break was still two minutes at that point, and a catch looked unlikely. There were several attacks out of the peloton on Stoke Hill, with Dylan Van Baarle, Edoardo Zardini and Nicolas Roche all trying and failing to stay away. Half a minute up the road Brändle was a lot more successful with his acceleration, and the time trial specialist used his pacing ability to hold on for the win. Archbold and Wynants held on to fill out the podium and ensure that nobody in the peloton would be taking bonus seconds. Yesterday we had to chase the break and I had to go really deep to try and make the catch. Today I thought maybe I can make it the opposite way, go in the breakaway and maybe its possible for the stage win. That’s what I tried today and finally it happened. In the middle of the race I think nobody in the breakaway really believed in the win because we only had one minute but then they gave us a little bit more. At 40km to go we said now we’ll go full speed like we really want to try and then suddenly the gap went out and it was not possible for Garmin to chase us back. I had the feeling that I was the strongest in the group. If you are the strongest you don’t want to wait for the sprint. Wynants had a good speed on the climb but I thought i could go faster. I just tried as hard as I could and when I looked back there was nobody on my wheel. It wasn’t easy for our team. We were trying to control the gap at two minutes and we knew that Brandle was at 3 minutes in the GC so it was not a dangerous breakaway for us. If someone from another team wants to win the stage then they have to take control and chase down the breakaway. I have to thank my teammates, they really took the pressure off me. Today I was really relaxed and recovered after leading for four stages so far. This was the first one I could feel really relaxed. Tough stage, I’m 3 seconds down on Kwiatowski. I hope to mantain this position and finish on the podium. Time trialing is not my speciality but I will try to defend my place. We came here with one goal and we wanted Chava to try and give him a shot on GC. Try and maybe pull back some seconds before the TT. Maybe with a bonus in the sprints or maybe in the finish with a late attack or something. I’ve verbally agreed to stay with the team. Nothing signed yet. [Van Baarle and Bauer] they’re going to try and make up some time in some way or another. 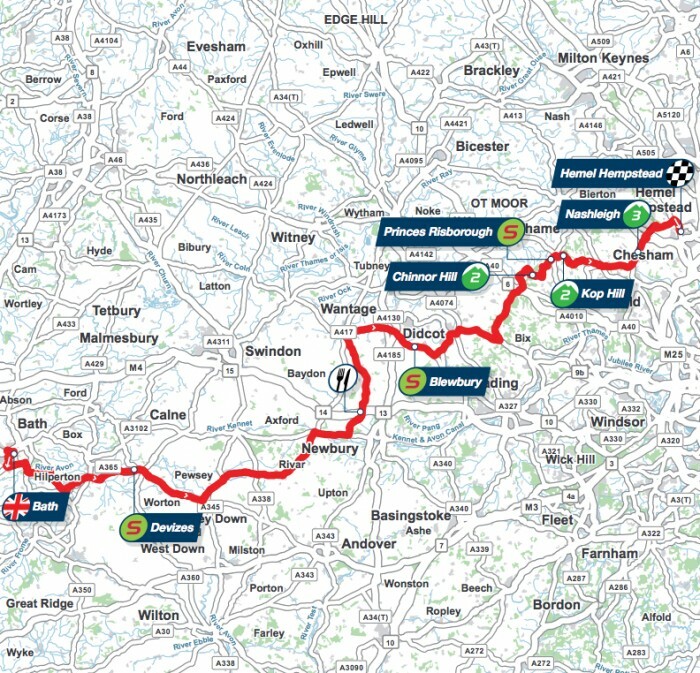 Its an unpredictable race with 6 riders in each team and these roads so hopefully we can take advantage of that. They’re both very very strong time trialists but its also not a long time trial and to leave it so late is not ideal so we hope to improve things a little bit before then. For full results and standings look here. 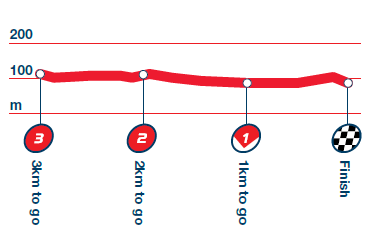 Its the longest stage of the race so far and yet another hilly stage, with most of the climbing shoehorned into the final 50km. There are a couple of second category climbs there, but the final hill before the finish in uncategorised. Expect a similar situation to Llandudno, as a small group contests the finish. The stage is harder, and backloaded with climbs. 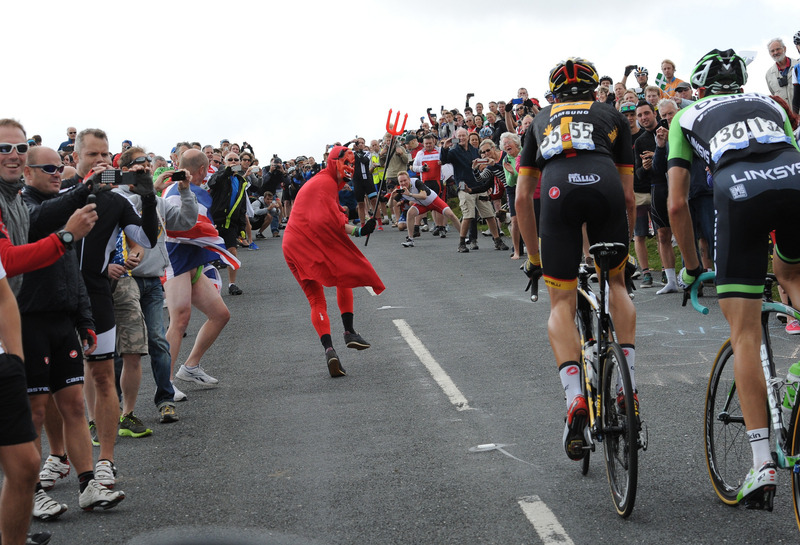 Three kilometres of flat road await the riders after the final climb, which could cause a problem for any lone escapee. Should there be a bunch finish, there are not too many obstacles to overcome, with a 90 d corner at 3km to go and a sweeping bend inside the final kilometre. Once again, it all depends on how the climbs are ridden. We could see some of the more versatile sprinters survive to the finish, or we could see another GC showdown as everybody battles for the bonus seconds on offer. Due to his versatility, Michał Kwiatkowski is the standout favourite. Should Mark Renshaw make it to the finish in the lead group then he’s a possibility too. Team Sky have a versatile sprinter in the shape of Ben Swift, but I don’t think Brad Wiggins is explosive enough to take the win here. Bardiani-CSF will be riding in support of Edoardo Zardini – he has a decent turn of speed while Sonny Colbrelli has a fast finish and can make it over the climbs. 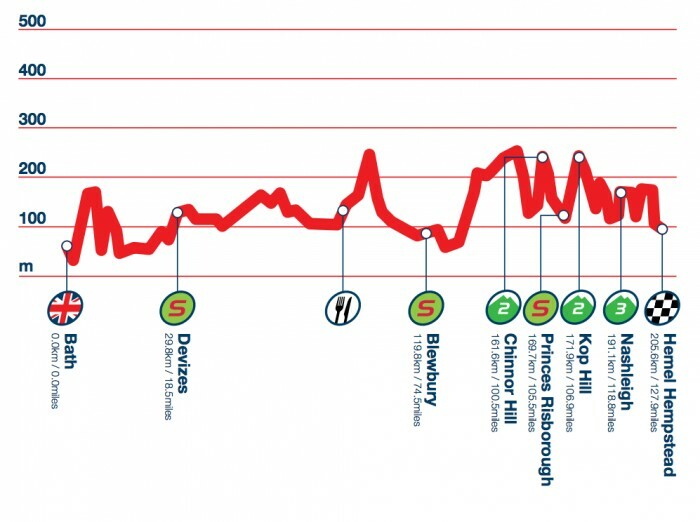 Sylvain Chavanel could try an attack over the final climb, while Heinrich Haussler could be a threat in a bunch sprint. Another name to look out for is BMC’s talented youngster Rick Zabel, who should feature if it comes down to a sprint.